Romance and history blend in this story of a 13th-century queen. Despite her significance in the history of Turkey, Mahperi Hatun is not a familiar name in the West, nor is that of her husband, the Seljuk Sultan Alaeddin Keykubad I. Further, history does not record much of their personal lives together. 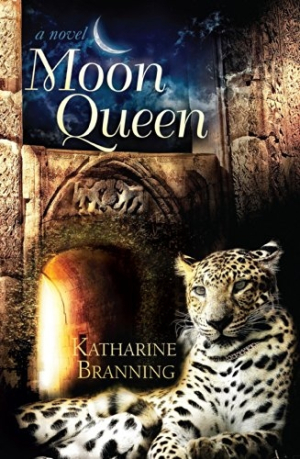 In Moon Queen, author Katharine Branning fills in the gaps with a story of passion, arts, and court intrigue, set against a lush backdrop of palaces and natural beauty. Mahperi was born Maryam, an Armenian Christian and the daughter of the lord of Kalonoros. Maryam was given to the Sultan Alaeddin to marry when the sultan conquered Kalonoros. Love at first sight leads to that marriage (whereafter the sultan renames her Mahperi, “moon fairy”), a son, and travel, as the sultan expands his domain and seeks to keep the Mongols at bay. Throughout their travels, Mahperi befriends craftspeople and, along with the sultan, commissions lavish public works. Branning is at her best when taking elements of history and culture unfamiliar to western readers and giving them an approachable context in the story, without it feeling forced or overly expository. She skillfully swirls together historical research—a copious amount, no question—and imagination. Her written voice is lush, poetic, and dramatic. This tendency toward ornate verbiage most often shows up in the interactions of Mahperi and Alaeddin, whose declarations of love and passion feel thrilling at first but later vacillate between endearing and cloying. Branning’s material descriptions, however, give an excellent sense of place, physically and historically. Throughout Moon Queen, there are potential conflicts that don’t always flesh out in a satisfying way. From the moment they meet, Mahperi and Alaeddin are crazy for each other, with hardly an argument following, even when Alaeddin takes a second wife. An entire novel could have come from each of the conflicts and differences in culture, geography, religion, ambition, and gender. As it is, though, Mahperi sails with ease through the majority of the book, passionate about her Christian faith and the love of her husband, but not terribly disturbed with much else until later in the story. The cover evokes an appropriately sensual scene. Historical romance readers looking for a sweeping love story will find Moon Queen transports them to a distant and ancient land.